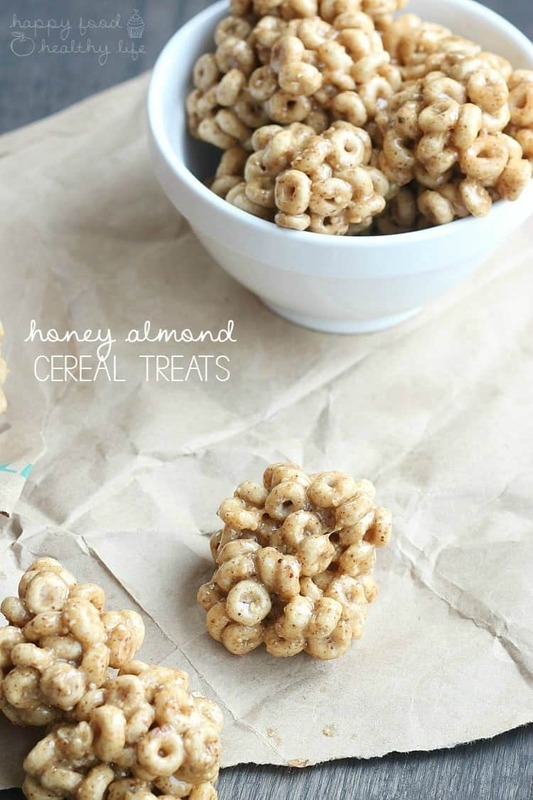 These Honey Almond Cereal Treats come together with 3 ingredients, less than 5 minutes, and a whole lot of yum! Having an eight-year-old boy is so much fun. He’s helpful. He’s curious. He’s super observant. He’s creative. He’s just always taking it all in. The pictures he draws always leave me amazed. The stories he tells remind me what it’s like to be a kid with an endless imagination. But also having an eight-year-old boy means that there is going to be a obsession love forvideo games. My Goodness! All the video games and all the time that he’d like to spend playing them. In fact, there have been a couple of mornings that I woke up at 4am for the day only to see my kiddo’s light on. Peaking my head in, I see that he’s already awake so he could play with his DS before having to get up and get ready for school. Someone tell me this phase eventually goes away? I’d much rather him read, draw, and build all day long! I have a feeling that’s just wishful thinking. My kiddo has quite a few video games that he loves, but his number one is Skylanders. Being able to change the figurine on the portal and it changes on the screen – I have to admit, that’s pretty dang cool. No wonder he’s such a fan. He sometimes just likes to play with the plastic guys on their own without playing the video game itself. So when I heard that General Mills had teamed up with the new Skylander game, Skystones, I had to jump on the opportunity to not only buy one of his favorite cereals but get the game and pieces in the box! Hidden inside specially marked General Mills cereals, fans will find Skystones cards playable on the game board found on the back of the cereal box. My kiddo was absolutely thrilled and wanted to play right then and there at the table. He’s working on collecting all four Skystones game card sets in the different cereal boxes. Here’s the awesome thing. The Skystones game is not on a television screen. It is instead full of family fun and fuels development through imaginative and cognitive play. This mama is definitely on board for that one! And while we’re playing, I thought we should probably have a little snack to go with the fun. Keeping Skylanders in mind, I decided to make these cereal treats that replicate the character “rocky roll” from the Skylander’s game. 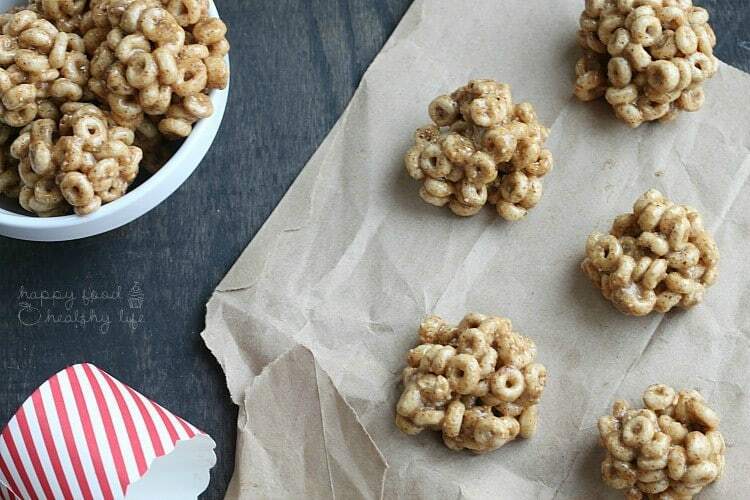 And with only 3 ingredients and a few minutes of your time, you can get snacking and playing without hesitation. In a small saucepan, melt honey and almond butter, stirring constantly so it doesn't burn. 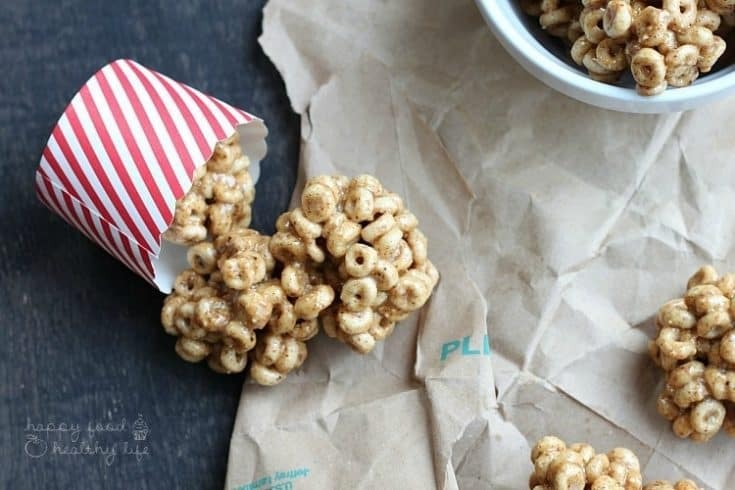 Once it's completely melty and pour-able, pour mixture over the cheerios in a large bowl. 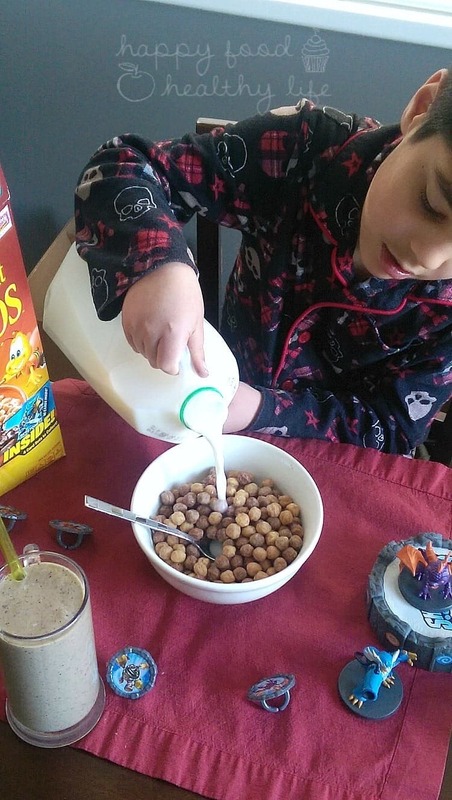 Mix well until the cheerios are covered. With damp hands so they don't stick to the cereal mixture, grab a golf-ball-sized amount and roll while pressing together into a ball form. Place on a baking sheet. Repeat for the remaining treats. Place in the refrigerator and cool for at least 30 minutes before serving. Store in air-tight bag or container. how could they not?! so simple and yum! 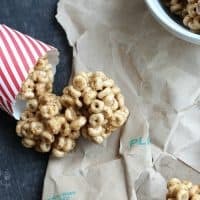 I have a similar recipe that I love not nearly healthy at all – and I call them ‘Pete’s Treats’. SO yummy!! I haven’t had them in years and years, this just brought back a flood of memories! ooooh I kinda want to try your unhealthy version now!